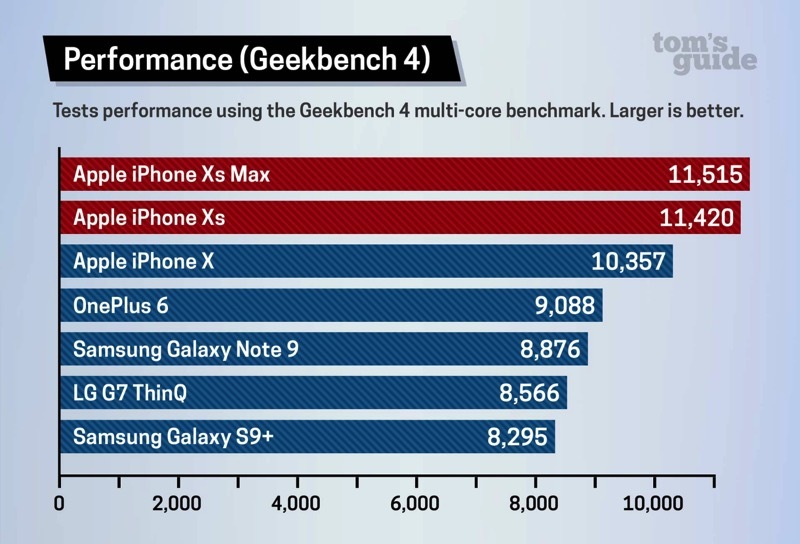 Tom’s Guide has released new benchmarks performed on their iPhone XS and iPhone XS Max review units from Apple, and their tests have concluded what the iPhone maker told us at their special event last week: A12 Bionic is the world’s most powerful mobile CPU. With a score of 11,515 on Geekbench multicore, the iPhone XS Max fares better than a Retina MacBook Pro with a quad-core Intel Core i7 CPU at 2.6GHz, and easily beating a 2017 13-inch MacBook Pro with dual-core Intel Core i7 at 3.5GHz. Back in July, alleged Geekbench 4 scores posted online showed a 2018 iPhone seeing multicore scores of 10912. Clearly, those scores look totally bogus as a final release A12 Bionic beat that number easily. 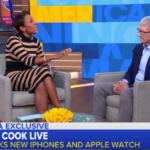 When it comes to video editing—transcoding a 2-minute 4K clip to 1080p with Adobe Premiere Clips—the iPhone XS and iPhone XS Max did it in 39 seconds and iPhone X at 43 seconds, way ahead of the competition. In fourth place was the Galaxy S9+ at 2 minutes and 32 seconds; LG G7 ThinQ in fifth at 3 minutes and 16 seconds, followed by the OnePlus 6 at 3 minutes and 45 seconds. App open times were also tested, with the iPhone XS Max loading Fortnite, Pokemon GO, Asphalt 9 and Tekken faster than the iPhone X and Galaxy Note 9. Tom’s Guide also looked at GFXBench 5.0/Metal tests, where the iPhone XS and iPhone XS Max showed some high frame rates on the Aztec Ruins and Car Chase parts of the test. The iPhone XS topped 1,774.1 frames, while the iPhone XS Max saw frames hit 1,744.44. However, the Galaxy S9+ beat both the iPhone XS and XS Max in the Car Chase test, hitting 1,783 frames. Overall, these tests show the A12 Bionic is definitely legit to take down the smartphone speed crown, easily beating Android phones running Qualcomm’s latest Snapdragon 845. Click here to check out all the benchmark scores over at Tom’s Guide.